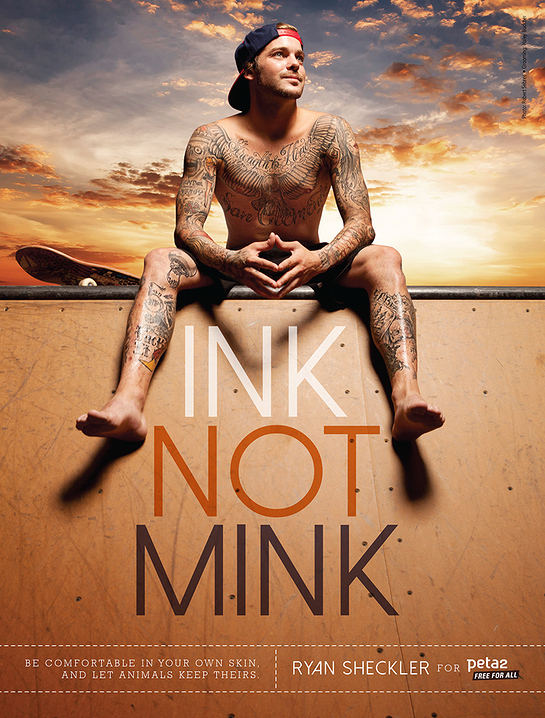 Radiating competitive zeal and professional confidence, pro skateboarder Ryan Sheckler bares striking tattoos and a rock-solid physique over a half pipe in a new ad for peta2, PETA's youth division. Every year, millions of animals — including foxes, rabbits, raccoons, minks, and even dogs and cats — are beaten, gassed, electrocuted, or even skinned alive for their fur. Sheckler and peta2, whose motto reads, in part, that “animals are not ours to wear,” want everyone to know that for every coat, collar, or cuff made of fur, animals suffered immensely — and that stylish, fur-free options are widely available from top designers and retailers such as Ralph Lauren, Forever 21, Stella McCartney, J. Crew, H&M, Tommy Hilfiger, Calvin Klein, and Gap Inc.
Sheckler joins a growing list of celebrities — including Carey Hart, Kid Ink, Megan Massacre, and Steve-O — who have teamed up to help peta2 stop animal abuse.